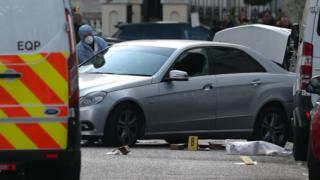 Officers opened fire in west London on Saturday morning during an incident involving a car that was colliding with vehicles. Officers used firearms and a Taser before arresting a man in his 40s on suspicion of attempted murder. The Met said its officers arrived at the scene just before 10:00 BST after "reports of antisocial behaviour involving a car". The embassy said none of its staff had been injured and that police were now investigating "the suspect's identity and motive for the attack". The police arrested the man on suspicion of the attempted murder of police officers and criminal damage. Local resident Heather Feiner, originally from the US, added: "From the time I heard the shots until I got to the window, which took about 15 seconds, all these police cars were already there. 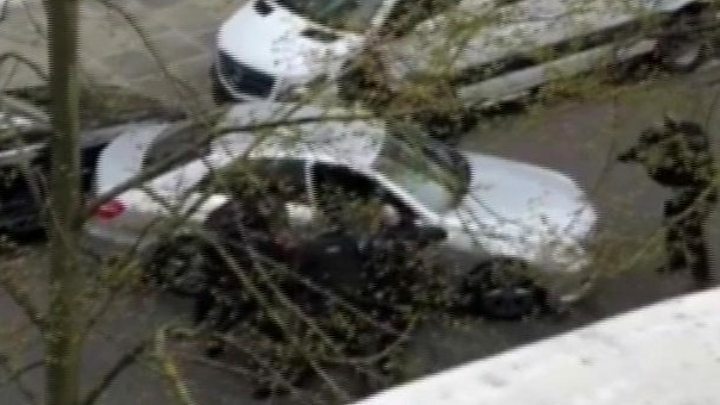 Emma Slatter, who witnessed the arrest, believes the man reversed into the diplomat's car while backing away from an oncoming police car. "It seems like he was moving erratically or wanting to move away from being boxed in, maybe not realising there were police behind him as well," she said. She added: "That was when he collided backwards." Ch Supt Andy Walker, from the Met's specialist firearms command, said: "As is standard procedure, an investigation is now ongoing into the discharge of a police firearm during this incident. Foreign Office minister Sir Alan Duncan tweeted that he was "very concerned" to hear about the incident and added that he'd spoken with Ukrainian ambassador to the UK Natalia Galibarenko. The MP for Rutland and Melton also thanked the police for their "swift response".